"EXOTIC GREENNESS" is a bright and cheery floral that is perfect for any occasion. 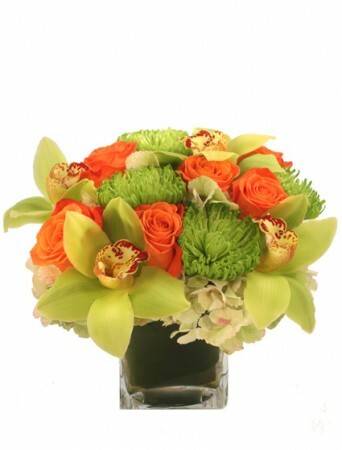 Glass cube is filled with green hydrangea, orange roses, green fuji mums and cymbidium orchids. 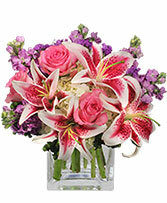 Show your love with More Than Words... our beautiful modern design featuring fragrant lilies, stock, hydrangea and pink roses. We specialize in delivering your love! 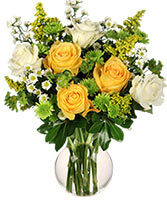 Order flowers from our website or call us. Giving Beautiful Fresh Flowers Will Fill Her Day with Sunshine and Love. To Send a Floral Arrangement in the Worthington, OH area, Call UP-TOWNE FLOWERS & GIFT SHOPPE Direct or Order Flowers Now from our Website.